WASHINGTON (CN) – President Donald Trump on Tuesday said “all options are on the table” the day after North Korea’s latest show of force sent a missile flying over northern Japan. North Korea’s launch last night was the boldest in the string of missile tests the country has conducted in the last two months, with previous provocations already earning Pyongyang new sanctions from the United Nations and a war of words with the United States. 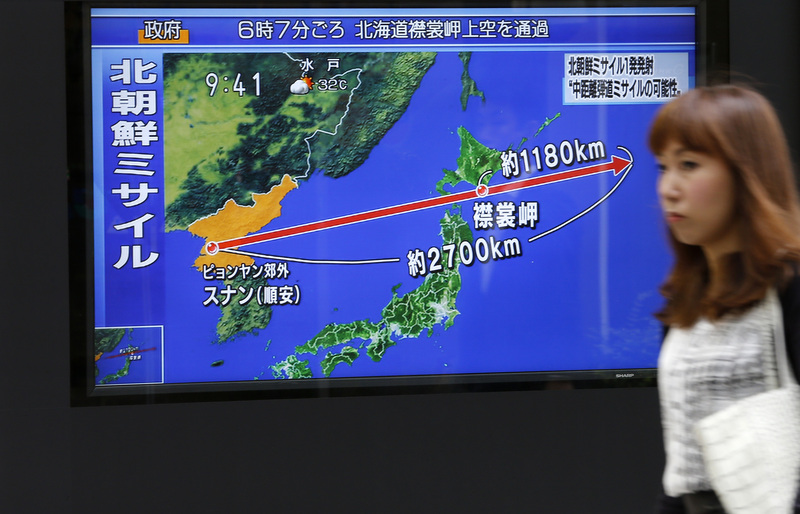 The test North Korea conducted yesterday sent a missile more than 1,600 miles, flying over northern Japan and splashing down in the Pacific Ocean. The Pentagon said in a statement on Monday that the missile did not threaten North America and the Associated Press reported that nothing in Japan was damaged. The launch over Japan comes after North Korea sent three other missiles into the sea over the weekend, apparently in response to military drills the United States and South Korea were conducting. The reclusive state’s recent ramp up in testing its missile system has drawn Trump’s ire over the past month, leading to the president promising “fire and fury like the world has never seen ” on Aug. 8. The United Nations Security Council put in place strict new sanctions on North Korea on Aug. 6, leading the North Korean foreign minister to proclaim the country would not give up its weapons as a condition of negotiating with the United States. That proclamation came the day after the Washington Post reported that U.S. intelligence determined North Korea had made a nuclear weapon small enough to fit on its ballistic missile, a technological step that was previously believed to be beyond the country’s ability.